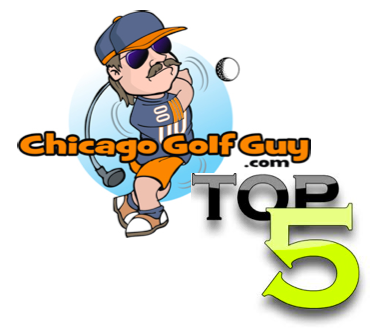 The Chicago Golf Guy February 27, 2012 Chicago Golf Guy's 2 Cents, Just Golf Stuff! USA Today pointed out in a recent article that in the past five years the number of golfers in the United States has declined by 13 percent. Last year, the number of rounds of golf played nationwide dropped by 3.5 percent. In part, the reason for these numbers has to do with time and money. While I would agree I would add another, and perhaps larger contributing factor: frustration. As we all know golf is not an easy game. Frank Thomas, former research director of the USGA said that over the past 20 years, despite all the advances in technology, the average male hits his drive approximately 200 yards, the average score hovers near 100, and for those that keep handicaps the average remains around 16. Despite this course architects continue to build longer and more difficult golf courses. And, men being men, play tees that are further and further back. So, if the average male hits his tee shot 200 yards and he’s playing a 423 yard par four what are the chances of his getting to the green in regulation? If a par three is 190 yards, and surrounded by bunkers, what are his chances of hitting the green at all? Add to that narrow fairways littered with hazards … what are his chances of even getting the ball in play? How many greens in regulation will he hit if he is hitting a fairway wood to virtually every par four, and on many par threes? “Move up!”, you say. Easier said then done when dealing with the fragile male ego. According to the USGA’s Tee it Forward initiative if a golfer’s average tee shot is 200 yards than he should be playing from 5,200 to 5,400 yards. The problem is not many golfers will play from that yardage, not to mention there aren’t many tee boxes with that yardage. Okay, let’s say the middle tees are approximately 6,200 yards. That would mean that the golfer would need to hit his tee shot an average of 250 yards. Not many golfers can hit it that far. Where does that leave our fellow who is 200 yards off the tee? Very frustrated. Last summer I went to the local muni and was paired with a three some. We were all roughly in our mid-50s. 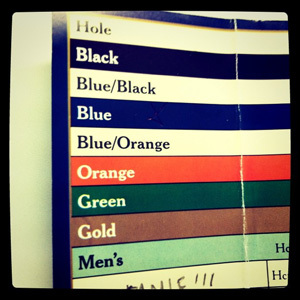 “What tee box are you playing from?” one gentleman asks me. “The middle tees,” I respond. “We always play from the back tees,” says another, in a rather self-important voice. We proceed to hit our tee shots. On our approaches my intrepid three some is hitting fairway woods or hybrids into the green while I’m hitting an 8-iron. This goes on for the next couple of holes, where none of them have yet to make a par, let alone a bogey. We get to the fourth hole. From the back tees this is a very intimidating tee shot. At a minimum you must hit your tee shot at least 230 yards over a pine tree onto a plateau to have any chance of getting to the green in two. None of my three some has yet to hit a tee shot over 200. If you tug it a little left you are in the trees that slope severely left. If you hit it right, you’re okay, but you have a long shot to a green that you can’t see and if you hit your approach a wee bit left, long, right or short you’re dead. From the middle tees if you hit it 200 yards you’re on the plateau and have a relatively easy shot to the green. If you hit it 230 you’ll knock it past the plateau and it will roll forever down to the front of the green. Needless to say my three some scored a big number on this hole. By the time we get to the fifth hole I’d heard enough curse words to make my drill instructors from my Marine Corps days blush. This is a monster par three from the back tees. An extremely narrow 210 yard hole flanked by oak trees on both sides coming closer together as they run up to the green. I’m thinking to myself, “What are these guys going to do here?” Two tee shots were lost in the woods and the third was well short. Another big number for all concerned. As we walk to the sixth tee I’m mentally scratching my head. My three some has been cursing, mumbling, and not having very much fun. I’m one over par, and they have yet to make a bogey. It’s not that they can’t hit the golf ball. They just don’t hit it very far. Why are they killing themselves? “Not at all,” I respond. The others quickly jump in. So, in the vast majority of cases what do we have? We have a golfer playing from a tee box where he has no chance in getting to the majority of par fours in regulation with two very good shots. Has no chance in getting to most of the par threes with a good shot. Must have an outstanding short game just to make a par. Must get very lucky to make a birdie. That really sounds like fun. 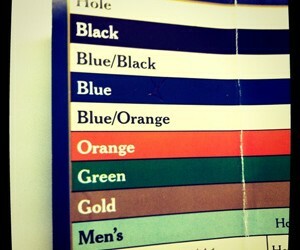 Is it any wonder the number of golfers is on the decline? What can be done? A few things. Superintendents can move up the tee boxes, and change the scorecards as well as the slope and rating. Although the USGA has the Tee it Forward initiative golfers will not move up on their own accord. They’ll need a push. New course designs can be more user friendly. Fairways can be wider, greens can be more approachable and courses can be made shorter. There is no reason courses are designed with the single digit in mind when the vast majority of golfers, and those that bring in the vast majority of revenue, are mid to high-handicappers. Perhaps if golfers start reaching greens in regulation, making the occasional birdie, not losing multiple balls a round, they may decide to stick with the game. If so golf will remain a healthy and viable sport, which can only benefit all of us.